Anyone attempting to build a car body from Ash will sooner or later need to bend some timber to shape, so this is a short article detailing how I made the two bent sections of the “C” cab sides. Some of you may know that wood is basically a composite material like fibreglass, in that it is made from fibres held together with natural resins/substances. A virtue of this is that we can weaken the bonds artificially by steaming and bend a piece of wood and then set it again allowing it to remain shaped/bent, much like a lady having a perm. Ash can be bent without steaming depending on the section size and how long the wood has been dried for. The best way of bending Ash like this is to use air dried wood that still has an amount of moisture left in it. Wood that is too dry or has been in a kiln will be harder to bend and may require re-hydrating to some extent. I chose instead to steam my sections because I fancied a go at it! I could probably have bent them without steaming although on saying that my wood was fairly dry as it had been in my friends wood yard for some time. The steamer itself is constructed from a piece of pipe I found at work that happened to be the right size. What you require is a box or pipe big enough to fit the wood in, with some room around to let the steam circulate, you could make one out of ply. I drilled the pipe and fitted two metal supports to rest the wood on whilst steaming to allow all round contact with the steam, don’t use wood for the supports, as if your steamer works it will bend! A wallpaper stripper then has the square stripping end unscrewed and the steam supply pipe is then inserted into one end of the steaming pipe and held in place with a rag. The wallpaper stripper is then filled and allowed to heat up and generate steam. You MUST allow copious amounts of steam to be flowing through your steam box/pipe before you slide your wood sections in. This took some time in my case. Once the wood is in the steamer, stuff a rag in the remaining open end and allow a vent hole to keep the steam circulating. You need to see plenty of steam going through and straight out again to get a good flow. Condensed water will run out as well, which you could save and re-use seeing as it is so expensive. You need of course first to decide on the shape/form of the bend. A template of some kind needs to be made, that can be transferred onto a bending jig. The jig in my case was a sheet of thick ply with some wood blocks positioned were needed so that the wood work piece could be bent around them. 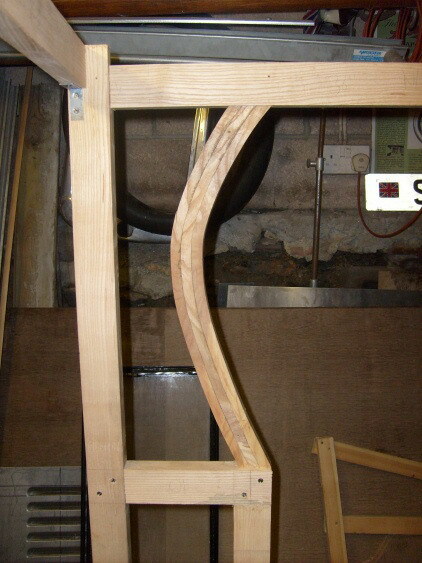 The jig needs to allow for over bending as the wood will relax slightly when removed. This seems to be were some skill comes into it! I guessed slightly wrong and my finished pieces were not quite as curved as my original drawing. This is easily cured by making another drawing afterwards to match the finished bend so it looks like you got it spot on if anyone asks! The aspect ratio of the finished section should now be considered i.e. is it thicker than it is wide? The piece should really be thinner than its width, in other words 2 by 1 timber would be bent so that the 2 inch sides would be the inside and outside of the bend and the 1 inch sides would become the sides of the bend. If, as in my case you want an aspect ratio that breaks this rule you must bend several pieces and then laminate them together, taking care to remember that the radius will differ as you build up the thickness. I bent three pieces at the same time on the jig so I knew they would fit together correctly. The wood should be as straight grained as possible and free from knots or other defects, otherwise it WILL break! The rule of thumb for steaming is one hour for every inch of thickness, so my half inch thick pieces were steamed for half an hour. Do not leave them in there too long as the resins in the wood will be lost and the wood will snap and become brittle. Likewise the wood must be in steam NOT boiling water, as the water can wash out the natural resins. Gloves are needed to remove the pieces and you MUST work quickly and have everything to hand. Remove the wood from the steamer and place into/on your jig and clamp or wedge one end. The wood can then be bent around to shape with a smooth even pressure using one hand for the thin pieces I did. You will feel the wood bending and here it sort of creaking as you go around, if it doesn’t feel like it is bending it will probably be springing and wont take the shape or may break, in this case more time in the steamer is needed. It will stop bending quite soon after removal from the steamer and just spring instead so make sure you are ready to go as soon as it is out! As an example I removed and bent my pieces in less than 20 seconds after removal from the steam pipe. The wood will be clamped in position once on the jig and should be left for 96 hours before removal, but NOT in a dry hot place. It will dry naturally in a garage with good results. 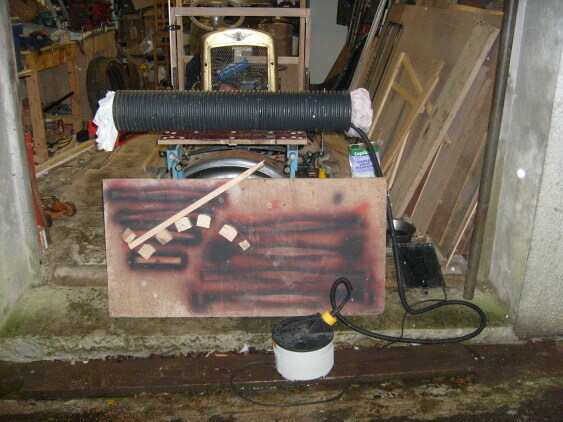 The pictures show the steam pipe with the wallpaper stripper visible on the floor with the steam pipe leading into it, and the bending jig with a piece of wood in position to demonstrate its use. The other picture is the finished article after sanding and glueing together the three laminates into one section. This article, written by Steve Martin, originally appeared in CA7C Seven Focus in Feb 2008 pp 16-18.